Over the past few years, there has been a continuous rise in the number of blockchain and cryptocurrency-related jobs. Why? It’s the future of the internet, and the efficiencies that smart contract technology can bring to any industry can both save time and generate money for companies of all sizes. Software is eating the world, and as Vitalik Buterin once said, Ethereum is the destroyer of jobs and creator of better ones. But even before bitcoin’s all time highs hit the mainstream media, the industry was already rapidly growing, and over the past three years, the number of cryptocurrency related jobs has grown 631%, to upstage blockchain-specific jobs, according to Blockgeeks. 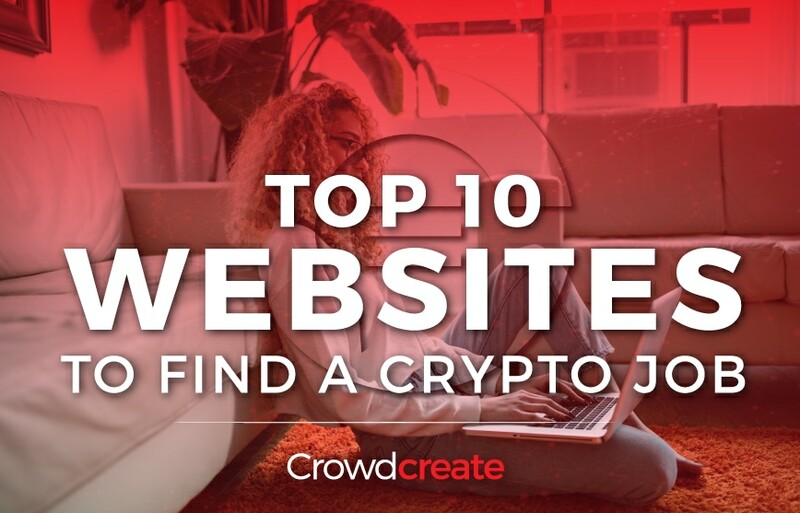 With so many new jobs around, crypto professionals are spoilt for choice, but finding these positions isn’t always so easy – here are ten of the most popular websites for finding crypto jobs. Crowdcreate is just one of the companies that has been growing and recruiting over the past few years. Our top-rated global marketing agency specializes in helping blockchain, ICO and STO projects explode with growth. We use a unique crypto growth marketing formula that includes Telegram community management, public relations, and working with crypto influencers – this makes us the #1 Crypto Community Management & Growth Agency. Advertising jobs for marketers, blockchain engineers, solidity developers and more, Crypto Jobs List helps companies and jobseekers all over the world to meet their match. CryptoJobs Is another job board built solely for filling open blockchain and cryptocurrency positions. In their own words, they are “on a mission to connect talented individuals to the best blockchain projects” and accelerate the building of a more decentralized world. Naval Ravikant’s Angel List lets jobseekers apply privately to thousands of jobs with only one application. Although focused more broadly on startups, the board has lots of opportunities for crypto enthusiasts. Crypto Recruit are specialist recruiters to the blockchain and cryptocurrency industry, and offer a job board for keen candidates. Cryptocurrencyjobs claims to be the leading blockchain job board on the web, and they certainly have a wide range of jobs for crypto enthusiasts to choose from. Be In Crypto is not just a job board, but an aggregator, and claims to add over 20 new jobs every day from the cryptocurrency and blockchain industries. If you’re a freelancer, then you might benefit from this blockchain-based platform connecting employers with those looking for freelance gigs. Unlike other intermediaries, Ethlance runs with 0% service fees, and takes no cut from the transactions between freelancers and employers. The only caveat is that you must accept payment in Ether. Submit your winning CV to Blockchain Headhunter and they will put you forward for lucrative jobs with the most reputable blockchain companies worldwide, and they have a job board if you just want to browse. If you don’t have any luck on the crypto-specific job boards, then take a look on Upwork – as the world’s largest online freelance platform, it holds many opportunities within the cryptocurrency space. With such a high growth rate, exciting opportunities are being created everyday in this industry, and there is a huge demand for talented professionals. Who knows, maybe even Crowdcreate are recruiting! Being the #1 Crowdcreate marketing agency is no easy task, and we take on the top talent to help our clients achieve explosive growth.